Here are three tips to help you work more precisely and quickly with the Pen tool in Photoshop. Each tip is based around some not so well known or hidden shortcuts and tool options. What magnetic pen? 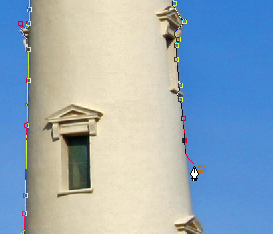 Yes, Photoshop has a well hidden Magnetic Pen option and very useful. If you like making selections using the magnetic lasso tool, then option will be right up your street. 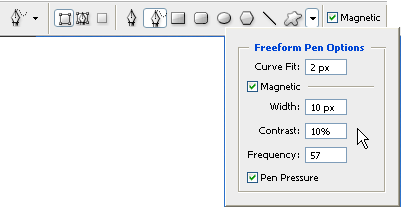 To find the Magnetic Pen option, first of all choose the Freeform Pen tool from the toolbox. (Press P for the Pen Tool and then Shift P to cycle through to the Freeform Pen tool). In the tool options at the top of the screen, click on the Magnetic checkbox. The cursor changes to show a little magnet on the pen tool and when you start to draw around an object the path you draw sticks on to the edge. This can be enormously helpful if you donâ€™t have a steady hand when drawing with the Freeform Pen tool. However, there are more options! Again on the tool options bar, click on the Custom Shape tool icon to reveal a pop-up menu. These give you much more control over how the points on the path will be laid out when you draw. Remember, when drawing paths a good rule of thumb for smooth edges is to use as FEW points as possible. As you might know, after youâ€™ve drawn a path with the Pen tool (or the Shape tools), you can go back and add or delete anchor points. The image below shows the various Pen tools in the toolbox. However, you can save a lot of time by not going back and forward to the toolbar to choose these tools. So letâ€™s say youâ€™ve drawn out a path with the pen tool and you now want to add another point. 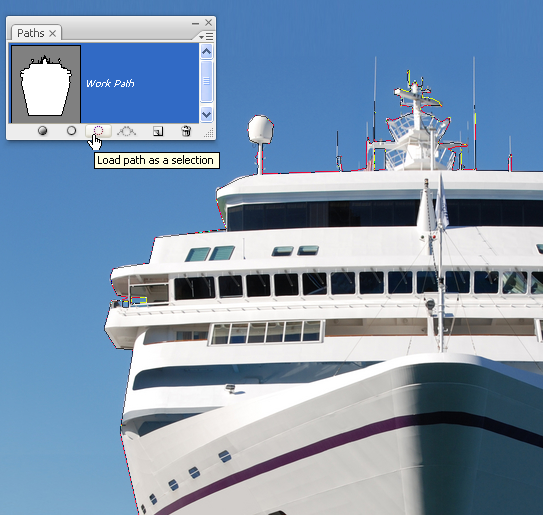 With the Pen tool still active, when you roll the cursor over a line segment, your Pen cursor automatically changes to the Add Anchor Point tool so you can click anywhere along that path to add a point. When you move your cursor over an existing anchor point, the cursor changes into the Delete Anchor Point tool (click on the point, and it’s deleted). This happens because there is an checkbox called Auto Add/Delete on the Pen tool options bar which is turned on by default. This is called “Auto Add/Delete,” and it’s on by default (you can turn if off, should you want to, using the checkbox in the Options Bar). To use the Convert Point tool without going back to the toolbox, simply hold down the Alt/Option key in conjunction with the Pen tool and click and drag any point to convert it from a straight point to a curve or vice versa. After youâ€™ve drawn out a path with the Pen tool, go the the Paths palette where youâ€™ll see a thumbnail version of your path. To change that path into a selection, click on the Load path as a selection icon. To save time though, you donâ€™t even have to open the Paths palette. After you draw your path simply use a keyboard shortcut Ctrl+Enter (Win) Cmd+Return (PC). Have you got some Pen tool tips youâ€™d like to share?